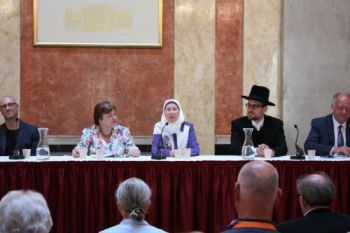 Under the slogan "Christians in dialogue for an open society", the Old Catholic Congress was held in Vienna from 20 to 23 September 2018. The extension of the title with the logo was "Salt of the Earth", a picture that was taken up several times in church services and speeches. Host was the Old Catholic Church of Austria with its bishop Heinz Lederleitner and a team of helpers, who made the stay possible and pleasant. Participants were laymen and clergy from the various Old Catholic churches, from the Anglican community, from the Mar Thoma Church, from the Philippine Independent Church and the Church of Sweden, as well as many other ecumenical guests. 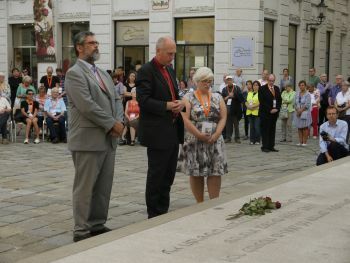 On Thursday a public event was held on the Judenplatz to commemorate the victims of National Socialism. More than 500 visitors attended the commemoration. Bishop Lederleitner asked forgiveness for the attitude of looking the other way during the Nazi dictatorship. All in all, the Old Catholic Church did not take a critical view of the new regime. Only occasionally were Old Catholic priests willing to raise their voices and risk their lives to support Jewish fellow citizens. They were also remembered at the celebration. At the official opening in the Old Town Hall the basic idea of the programme was made known: This congress with representatives from 16 countries is to be the impetus to engage oneself unequivocally and constructively in social processes. For the Old Catholic Church, human rights are the guidelines for opposing all forms of xenophobia, discrimination and stigmatisation. Friday morning was dedicated to a panel discussion on the congress theme with representatives of Buddhism, Islam, Judaism and the Christian churches in the Ceremonial Hall of the Old Mass. On Friday afternoon, the participants could choose from different workshops, which took place in different places in the centre of Vienna. Also on Saturday a series of workshops were held, which the participants had chosen in the run-up to the congress. In the workshops, the congress dealt with the following overriding questions: How can we be the salt of the earth? What vision of a world worth living in do we share? How do we want to live up to our responsibility for actively shaping the future? Participants addressed issues of social justice, fair business practices, environmentally sustainable consumption and overcoming fears in the context of a rapidly changing world. The church services were also well attended, such as the night prayer on Thursday in St. Salvator, the Ecumenical Morning Prayer in the choir of St. Stephen's Cathedral on Saturday and the official festive service of the Utrecht Union in the afternoon in the Evangelical Church of Resurrection, chaired by Archbishop Dr. Joris Vercammen. Those who had not yet left were able to end the Congress on Sunday by attending a service of the host church. Many thanks to the Austrian Sister Church for the organization and hospitality in Vienna! The International Old Catholic Congress takes place every four years and has the character of an international Old Catholic Church Congress.